Boredom can sometimes be the cause of decreased productivity, and even if you enjoy your work, sitting and performing the same action for 8 hours straight can become mundane. Fortunately there are ways to counteract these periods of boredom. Whether you're an employee wanting to increase your own productivity or an employer who wants to create a more productive environment throughout your office, take a look at these 3 office furniture pieces that can promote productivity within the office. There is a good reason that sit to stand desks are so popular and it's because it's an easy way to get the blood flowing while still staying focused on your work. 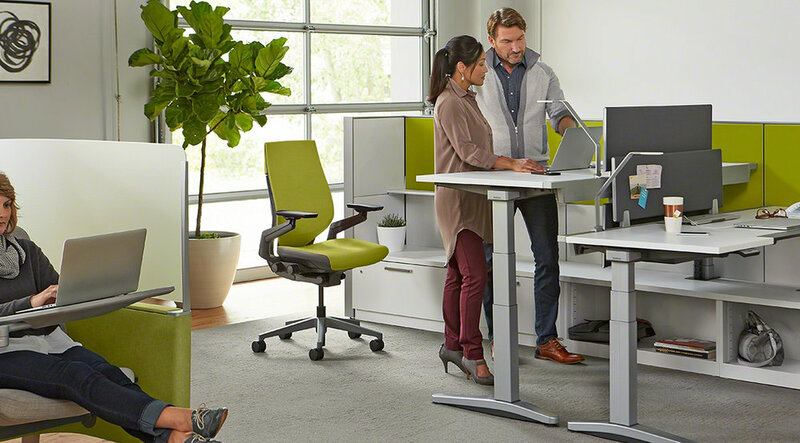 We understand that people can't always take time away from work to take a walk, so having a desk that promotes movement can be a good solution. Some desks tell you when it's a good time to stand up and sit down and some desks you can control yourself. The point is, creativity is abundant in the mind when there is physical activity happening. These desks can promote focus, new ideas, and increased productivity. Stools are often great for sit to stand desks due to the height, but there are stools that you can adjust to fit an average desk as well. Stools like The Pogo Stool are also great for your core since it requires balance and coordination to sit on them. These stools subtly get your muscles moving which can promote concentration and productivity. It's not always necessary to collaborate and talk with other employees, but taking a break and bouncing ideas off one another can really jog the mind in a great way. Giving your employees the option to have a collaborative space to use every now and then can be a great way to create communication, new ideas, and productivity.